Miffy has released her own crochet dolls which even come with their own outfit! Miffy just loves Easter and eating delicious goodies. And here is someone who loves the occasion just as much as her – Sarah Yewman who made this gorgeous little Miffy bag, perfect for carrying around your Easter eggs. 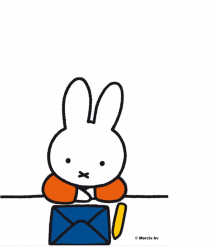 Miffy loves arts and crafts, especially painting. Every day, she can’t wait to get home from school and try making something new.